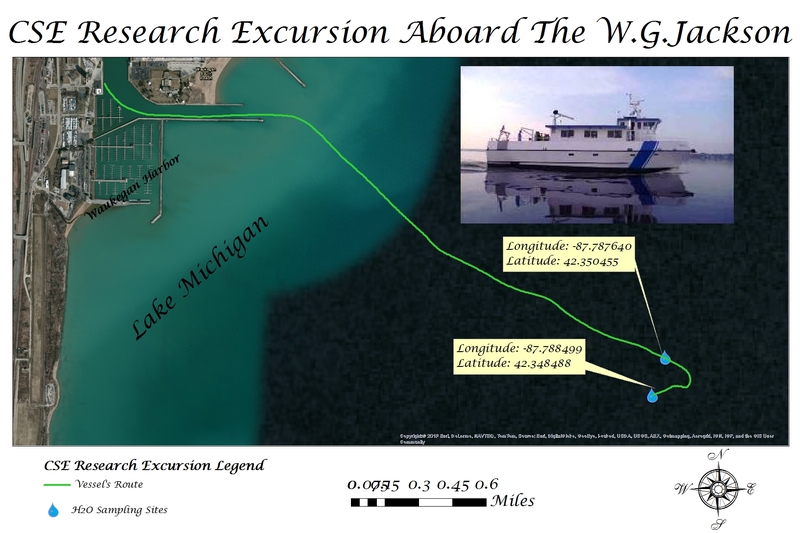 The following post was written by Matthew Kauth, a GIS analyst and instructor, who helps run one of our summer programs called Cool Summer Experience (CSE), sponsored by the First Baptist Church in Waukegan. For two summers now, the Geographic Society of Chicago has trained CSE campers how to use GPS equipment and how to understand geospatial technology and data. The following is what took place this summer. Working with the Cool Summer Experience program this summer was very insightful. The students were exposed to GPS and GIS technology. The results of the students’ enthusiasm was very positive and contradicted my initial belief that this technology was beyond the students. 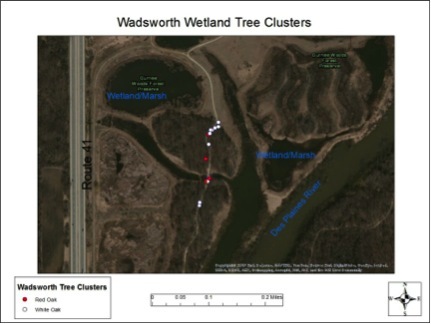 Students and staff applied this technology to research projects that had a spatial aspect. The students were divided to three groups according to grade levels. Given these tools, students were able to analyze data they had been collecting with GPS units. The groups were able to identify patterns, and in two cases, prove and disprove their hypothesis. The third group constructed a temporal comparative research project. 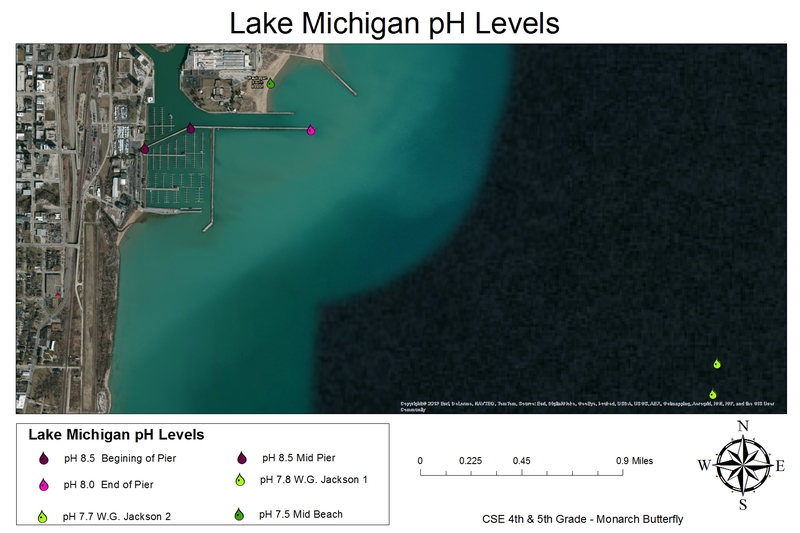 The fourth and fifth grades analyzed pH levels from the Waukegan Harbor, in addition to two points approximately one mile off shore. 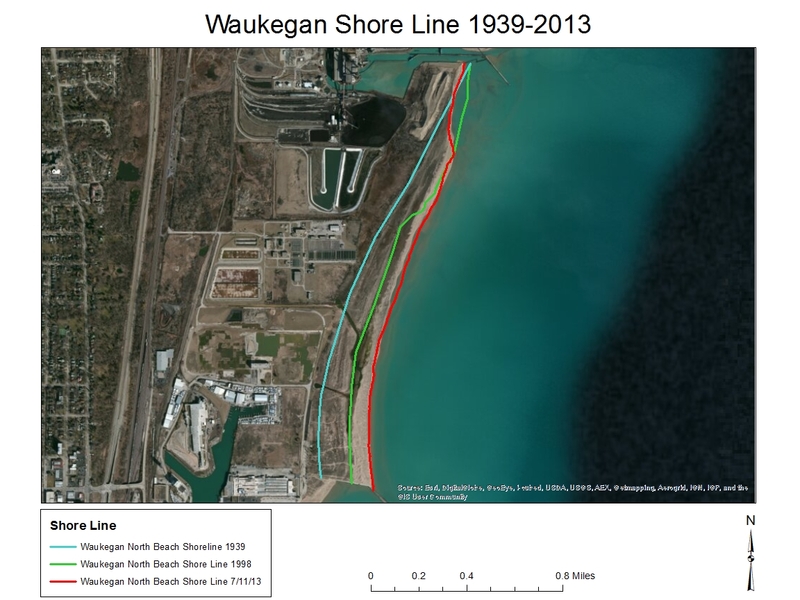 The students hypothesized that the pH level would increase progressing away from the shore. After analyzing the data using GIS, the data revealed the exact opposite. The disproving of the hypothesis was very educational in that the students had found the pattern of their way points in addition to learning that formulating a hypothesis that is not correct, holds no negative connotations. 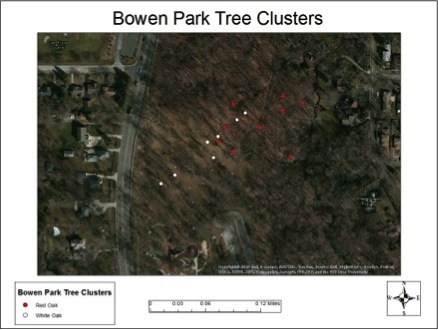 Grades six and seven identified Red Oaks and White oaks at three locations. 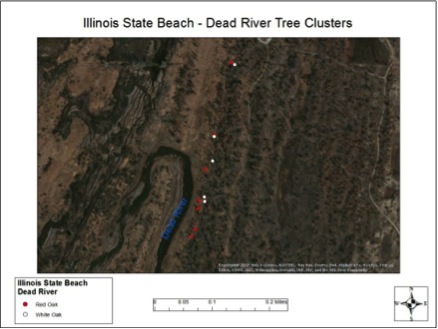 The project was constructed to prove the hypothesis that Red Oaks would establish themselves closer to a water source than White Oaks. Upon completion of the project, the hypothesis was proven to be correct. Albeit, some locations yielded more telling results than others, the students identified the pattern. Grade 8 was the only group to perform a temporal and comparative study. 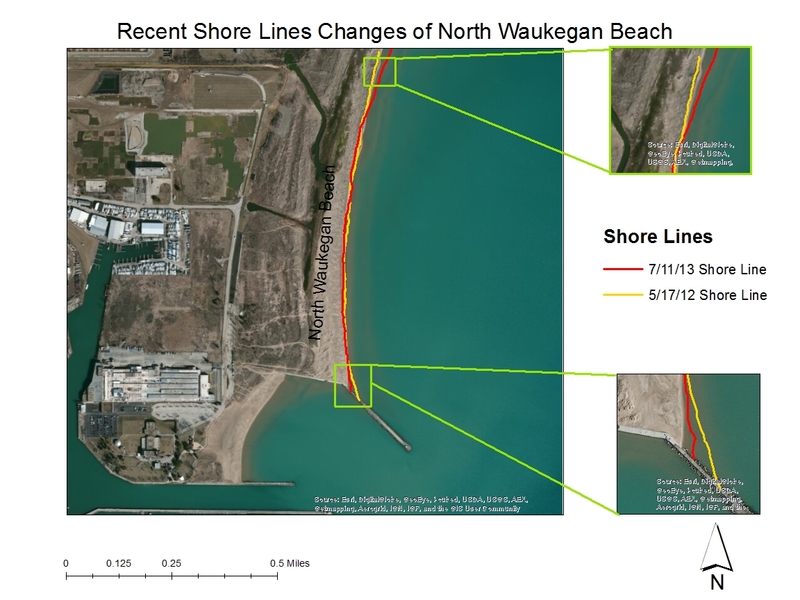 Complimented with both recent data and data that was more than a decade old, the group created a track of shoreline at a local beach. This project was able to compare on a micro level their collected data with that of data collected recently. In addition, the macro comparison was analyzed when all years of data were compared collectively. Collectively, these students seemed to be very disinterested in the GPS units at the beginning. As time went on, though, the interest continually piqued as we discussed the importance of spatial data as it related to their respective research projects. Ultimately, all grade levels were more intrigued as the combination of the GPS and GIS unfolded, and their efforts in field data collection was presented in a visual format. In addition, and most important was the ability for the students to observe patterns. The results of each project were discussed with the classes and a dialogue of spatial patterns, and their importance ensued. Last, the students were exposed to the tools provided by Arcgis Online. The tools used were measuring distances, calculating areas of polygons, the students own cognitive thinking in using symbols and colors to represent their data. This is very cool and a great thing for kids to do! EXCELLENT! Great programming and opportunities for students to learn GIS in a practical and useful way.